The Musée Regards de Provence houses a wonderful collection of paintings by local artists, giving visitors a special experience: when in Provence why not admire pictures of Provence? Unfortunately the museum is still bedevilled by construction work which seems to have been going on forever. Visitors have to walk the gauntlet of diggers and bollards and zigzag round mesh screens. But it’s worth it to see ‘Marseille the Eternal’. 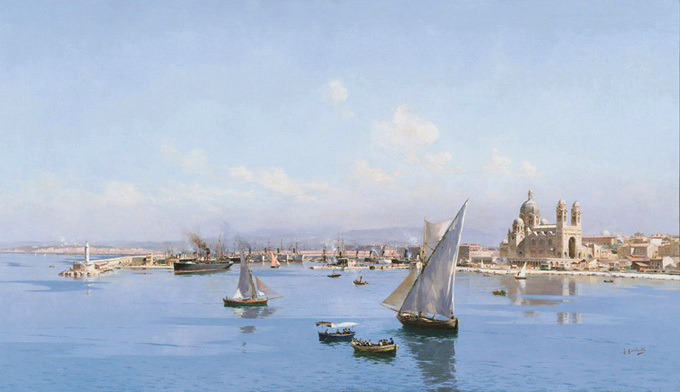 This selection focuses on the town of Marseille which was a magnet for local painters. There are views of the Vieux Port, the boats, the fishermen, storms at sea and of course the streets and the townspeople. 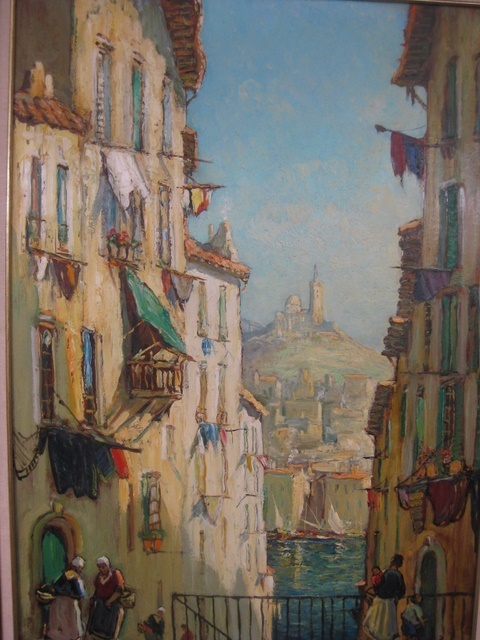 This painting (left) is by Joseph Marius Hurard who worked from narrow streets of the Panier, looking across to the church of Notre Dame de la Garde. You can enjoy the very same view by walking round from the gallery into the Panier to stand in the same spot. And there’s still lots of washing at the windows! Another Joseph, Joseph Garibaldi, had his atelier on the Vieux Port during the 19th century and loved to paint the boats in the harbour. Impressionism, Fauvism, Cubism came and went but he painted on in his own style, faithfully reproducing what he could see. The detail on this painting (Le Port de la Joliette) is very fine and it is especially fascinating when you have just walked along past all the buildings and indeed the Cathedral where all the development for the new shopping centre (Les Halles) is taking place. I don’t know what he would have made of all the construction work and indeed the shiny new Terrasses du Port. What a tranquil scene it seems back inthe 1890s. But despite all the developments, the sea is still beautifully blue, the boats ply their trade and people enjoy the streets, cafés and the beach. There is indeed something eternal about Marseille. 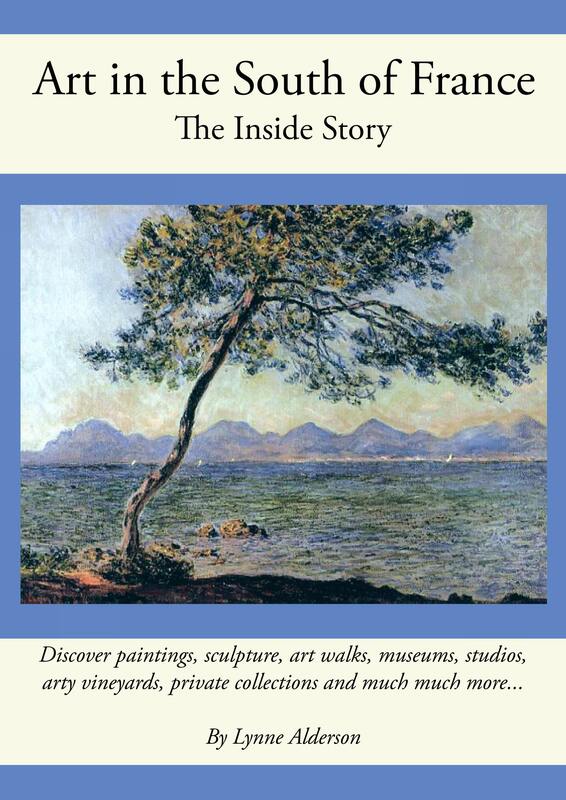 Daily 10-18:00; Until 25th January, 2015. www.museeregardsdeprovence.com. With MUCEM getting so much attention, it’s understandable that some people are not crossing the road to visit the nearby Musée Regards de Provence. A mistake! Not only does it have some interesting and usually local paintings (which I’ll come onto), its top floor has a restaurant and café-terrace that must be one of the nicest places to have a drink in Marseille. (There is a separate entrance and lift). 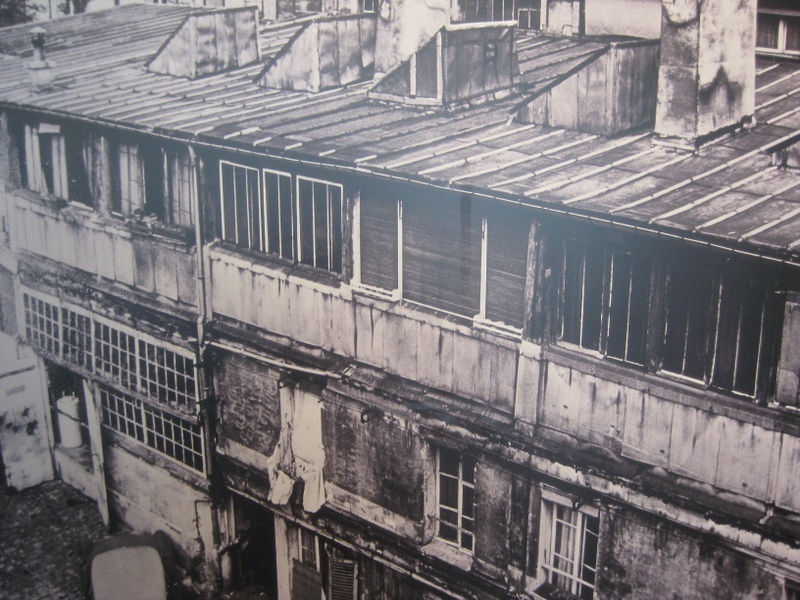 The building was the station sanitaire for immigrants arriving at the port, for what must have been a grim experience. Now beautifully renovated, light floods through the galleries and the huge windows give visitors panoramic views of Fort Jean and MUCEM right along to the docks. The gallery is privately owned and is dedicated to Provencal art, either focusing on the life and work of one painter or taking a theme like the current ‘Femmes en Provence’ on til 4th May. Which makes the new exhibition ‘Autour du Bateau-Lavoir: Des artistes a Montmartre (1892-1930) et la Méditerranée’ a little different in that its main focus is on work done in Paris. There are a couple of Marseillais painters included and the artists did get down to the south of France to work, but the story really revolves around the iconic Bateau-Lavoir building in Montmartre. 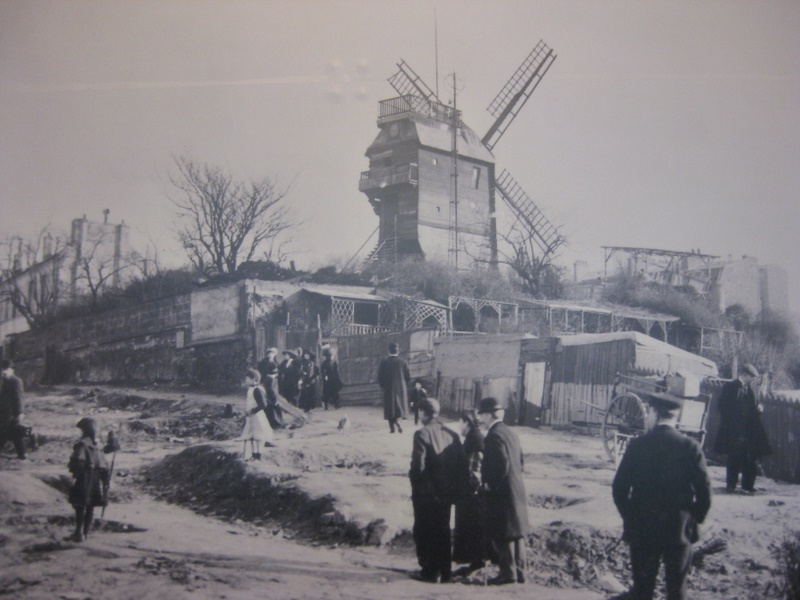 Just 100 years ago, this was very much on the edge of Paris, an exposed hillside with dairy cows grazing, 18 windmills and very cheap housing – hence its attraction for artists. 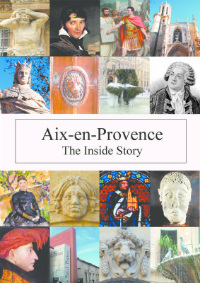 Firstly, ‘ La Provence, terre de rencontres entre artistes et écrivains ‘ at the Regards de Provence gallery has been extended to 16th March 2014; and at the same gallery, ‘Femmes en Provence et en Méditerranée’ will run to the 4th May. Here is my original review of both exhibitions when I visited back in October: https://aixcentric.com/2013/10/31/painting-provence/ It’s a beautiful space and both exhibitions are well worth visiting. Recommended! Weekend Events – Quite a Choice! It’s summer, it’s hot…and so is the choice of outings this weekend. 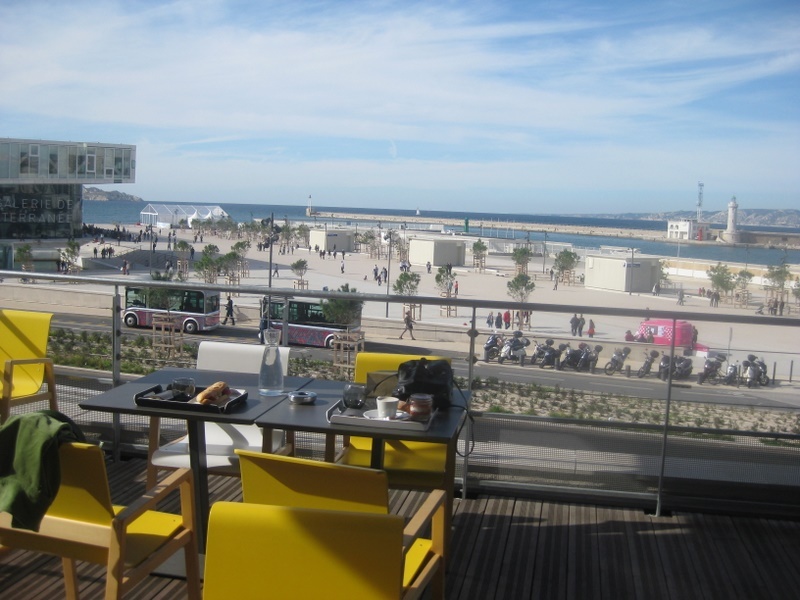 MUCEM finally opens (see last post) and remember across the road there is the beautifully-restored sanitary station which houses the Regards de Provence museum. Their colourful show of paintings of Marseille, highly recommended, has been extended to 16th June, open daily. But the most astonishing event has to be the culmination of the TransHumance processions which arrive in Marseille this coming weekend. How will the assorted sheep, goats and horses fare when streaming through the streets of France’s second largest city? 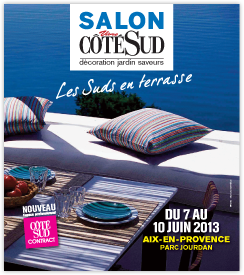 In complete contrast, the Vive Coté Sud show in Aix’s Parc Jourdan enters its 15th year. The theme this year is ‘Les Suds en Terrasse’. I love the French expression, ‘un petit coin de paradis’ and this exhibition shows you how to create one. There are lots of stands to inspire and interviews with designers and architects to inform. I have been to several of these shows over the years and always come out with lots of ideas, to the joy of M. Aixcentric………. The Great Gatsby is still on at the cinemas and I would highly recommend it. I was put off by the negativity of many of the reviews, but, when I finally saw it, really enjoyed it. The cinematography is outstanding – especially in 3D – with the camera zooming through the opulent parties at West Egg and the contrasting desolation of the Valley of Ashes; the acting is good, especially Carey Mulligan as Daisy. The costumes and sets are just wonderful; and I was surprised by the power and impact of the Jay-Z and Beyoncé soundtrack. Baz Luhrmann’s interpretation stuck pretty well to Fitzgerald’s plot and brought the novel alive right up to the sadness of the famous ending. Recommended! Sometimes I do struggle to understand what is going on round here. 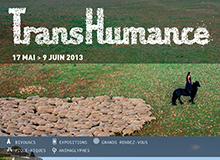 Have a look at this one: http://www.mp2013.fr/evenements/2013/06/in-loving-memory-2/?lang=en where ‘audiences relearn how to breathe together, to think and to speak’. It seems to be some sort of theatrical/cinematic experience…if anyone goes, do let us know what it is!! Amid a veritable building site down in the docks, with cranes and construction workers and car-ferries coming and going, the new Musée Regards de Provence has opened and it is wonderful. It’s housed in the old Station Sanitaire and signage indicates what awaited the immigrants – rooms for déshabillage, desinfection and service DDT. But today the building is full of big open spaces, flooded with light and filled with wonderful local paintings. 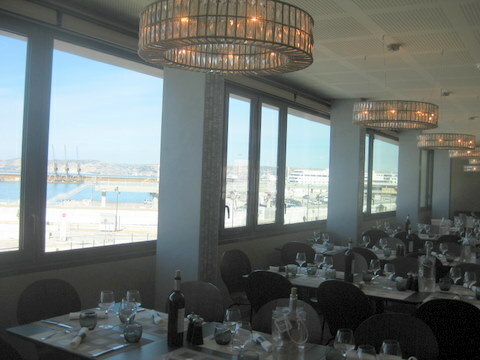 The first floor concentrates on paintings of Marseille. So if you have just walked to the museum along the Vieux Port, you will have walked right through the subject of many of the pictures! 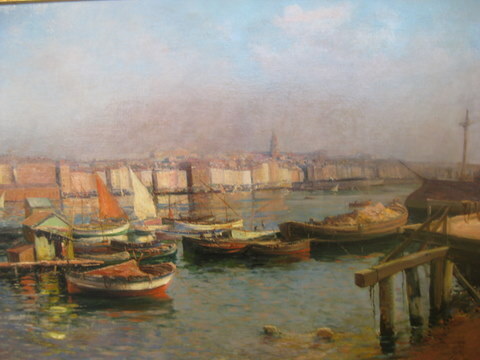 This is how Louis Nattero saw the Quai du Port in the early years of the 19th century. Not only is it a lovely painting in its own right, but it gives us a view of the old buildings that were detonated in WW2. Another painter I’d never heard of, Joseph Marius Hurard, worked from the opposite side. He was in the narrow streets of the Panier, looking across to the church up on the hill. What a wonderful composition this is. ‘Notre Dame de la Garde et Les Escaliers de la Rue Bompard’ focuses on the church in the centre of the painting, but it is framed by the real subject of the work – the busy street life of the Panier. The windows are adorned with washing and the women in the street chat as they come back from the market or the fish-quay. The second floor of the gallery widens its focus to include paintings from all over Provence, and there are so many treats in store. There are works by Marchand, Chabaud, Seyssaud and Ambrogiani who is represented by a long and colourful painting which illustrates Provence from the Camargue to the Cote d’Azur. One of my favourites. Modern paintings are grouped in the Salle d’Estaque and, as with most contemporary art, it’s a mixed bag. 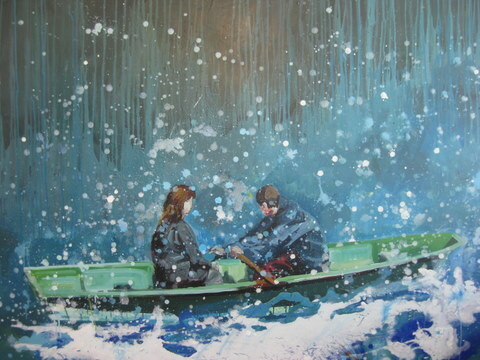 But this work ‘Plan d’Eau’ 2004 from Patrick Moquet, another artist new to me, was outstanding. Right at the top of the building is a very elegant restaurant with fabulous views across the docks and out to sea. I went up for a coffee (11:30) but the whole place was set out for lunch. They were OK about it and moved place settings etc so I could just have a coffee. They have a good lunch menu with plats du jour but also light options. If you opt for the beef, there are signs to reassure you that the animal was ‘né en France et abbattu en France’. It’s a fabulous spot to sit and eat – especially if you like watching cranes and boats! The whole museum has been finished to the highest standard and is a pleasure to visit. Even today’s deluge couldn’t spoil the Mediterranean sunshine emanating from the paintings on show at the Palais des Arts. ‘Louis Valtat & ses contemporains’ brings together 90 works by artists working in Provence/Cote d’Azur at the turn of last century. Influence by the Fauves and the Nabis, they embraced all the colours of their palettes and turned out portraits, local landscapes and seascapes, pictures of flowers and fruit, and especially the red rocks of the Esterel and Agay. The Fondation Regards de Provence, housed in the old municipal archives, will be showing the works until 19th February. While there, I learned that the collection will be moving to a renovated and extended building down in the docks area, next to the Cathédrale de la Major. The new space will allow them to hold 4 temporary exhibitions at the same time as showing their permanent collection; and of course instead of being tucked away at the bottom of the cours Julien, they will be in prime position for all the tourists coming off cruise ships and the visitors for the year of culture. It’s great news for the gallery to have such a good space to move to – but somehow I will miss the old empty wooden shelves in the current quirky museum.